I think I may have mentioned a few times that I love Slimming World…! It’s all about healthy eating, rather than “dieting” – everything’s allowed in moderation, and it helped me to lose almost 6 stone in under a year, while still enjoying meals out. Not bad at all! I love it so much, in fact, that I now run my own Slimming World group at Ashton Park School on Thursday nights – you can find all the details here. One key to success, for me, was ensuring that I always had something in the fridge that I could pick at…whether it was chopped veg sticks, pickles, cured meats or something else. If I had healthy snacks to hand, I was less likely to go back to old habits and munch on a biscuit (or several…) instead: Slimming World is all about changing eating habits for life. 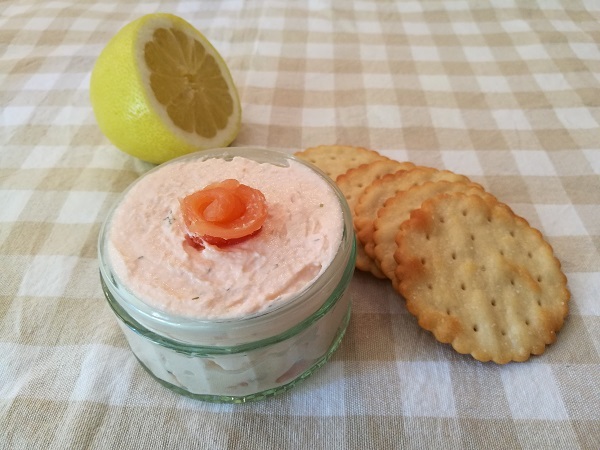 There are a few recipes that I go back to time and time again from a snacking point of view, and my smoked salmon pâté is one of them. Instead of using full fat cream cheese or crème fraîche, this version uses quark: a German soft cheese made with skimmed milk which you’ll find with the Philly etc. in supermarkets, with low fat/fat free varieties “free” on Slimming World (meaning you can enjoy them in unlimited quantities). In fact, every single ingredient in this recipe is free, which means you can eat as much of the pâté as you like while following the plan, and still lose weight. 1. Blend together the quark and smoked salmon until smooth. 2. Stir through the lemon juice and dill – add as much as you need to suit your taste.